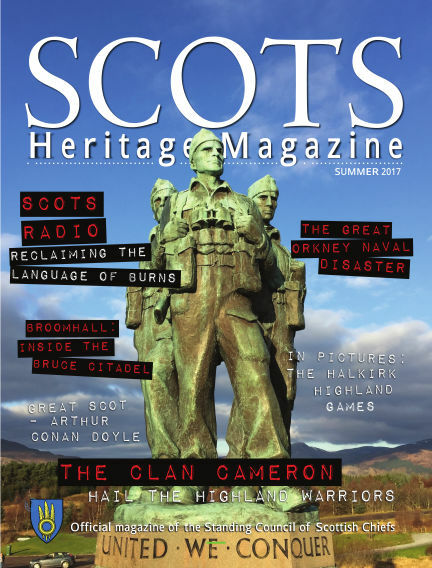 In this issue of Scots Heritage Magazine : For more than 12 years Scots Heritage Magazine,the Journal of the Scots Heritage Society,has brought its wide readership a regular diet of articles celebrating the rich and colourful history and heritage of the country. Aware of the magazine’s remit in providing an authentic flavour of Scotland to all corners of the world I am delighted to be able to continue the traditions and to welcome visitors to our new website. As Scots Heritage Magazine serves such wide and diverse parts of the world it would be encouraging to have comments and suggestions for future content so that we can meet your needs and aspirations. I hope that you will use the website to join with me and the Scots heritage team in spreading the best of our heritage and culture across the globe. While Scotland’s past is of huge interest to all our readers,I am also aware that many exiled Scots and those of Scottish descent are keen to keep abreast with what is happening in Scotland today. This is especially evident among those who enjoy the friendship and camaraderie of being involved with clan societies as it brings them closer to their roots. There are thousands and thousands of Scottish descent scattered in far-flung parts of the world and many of them are keen to know about their ancestors and the places from whence they came. It is my hope that our website will act as a boost to the magazine so that readers can visit us regularly and perhaps learn more about their past and the part their families played in Scottish life. The website will also be a link with which to keep in touch with news,views and events taking place in Scotland. As we are now in the summer season for highland games and shows there is much to report as Scotland’s outdoor social activities take place in highland glens,in the Borders and in the towns and cities. Many of the clans participate in local highland games such as those at Lochearnhead in Perthshire which take place at the end of July and where the MacGregors,the MacNabs and the MacLarens are to the fore. Likewise,Clan Donald always supports Glenfinnan Highland Gathering,which is held at the head of Loch Shiel on the Road to the Isles,while the Argyllshire Gathering held in Oban at the end of August plays hosts to the Campbells,MacDougalls,MacLeans and MacLachlans and other local clans and septs. With Readly you can read Scots Heritage Magazine (issue Summer 2017) and thousands of other magazines on your tablet and smartphone. Get access to all with just one subscription. New releases and back issues – all included.